Swing your knees to your elbows during the K2E. Crunches and sit-ups are likely the two exercises that come to mind when you think about working your ab muscles. But if you want to try something less traditional, the knee to elbow exercise works your abs while your body hangs in the air. This changes the dynamic of working your abdominal muscles. And although K2Es are effective, it takes a lot of strength to perform them correctly. Throughout the K2E, you will work your rectus abdominis, which start at your pelvis and terminate at your ribs. This vital muscle set controls the forward bending of your spine. They also control the shape of your spine and pelvic tilt. When these muscles weaken, your pelvis will tilt backward, contributing to poor erector spinae positioning. This condition can contribute to lower back pain or cause your pelvis to point backward. First, you need to locate a pull up bar that has the strength to support your weight throughout the exercise. Wear leather workout gloves to comfort your hands while you hang from the bar if needed. This also reduces friction between your hands and the bar during the exercise. Warm up your body with light aerobic exercises like jumping jacks or jogging in place for grabbing the pull up bar. Jump up and grab the bar while keeping your hands shoulder-width apart. Start slowly, by performing five knee raises, by bringing your knees up to your chest. This is a fall back exercise, if you get tired or cannot maintain the proper form when performing the K2E exercise. When your ab muscles are warm and ready, bring your knees to your elbows, while keeping your knees hip-width apart. Move slowly through 10 reps. As you move through the exercise, make sure to lift your hips with your abs without swinging your head backward or swinging your entire body to lift your legs. Swinging your body while lifting your legs could sideline you with a back injury. Varying the speed shortens you the time required to finish a set of K2Es, but another variation includes another set of abdominal muscles that also require attention. Your obliques run along your sides and run into your rectus abdominis muscles. 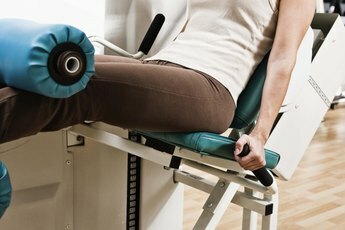 Twisting your legs as you bring your knees to your elbows enacts this powerful muscle group. When you lift your legs, bring your knees together and touch your right knee to your left elbow, lower your legs to the starting position, than bring your left knee to your right elbow and repeat five to 10 times.